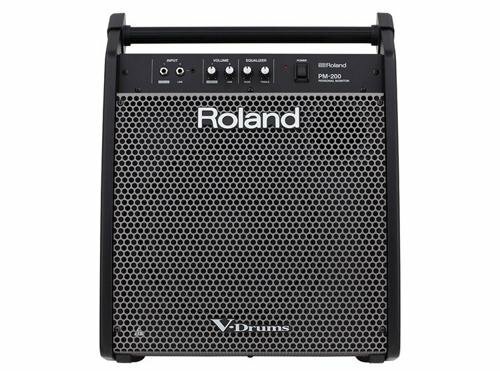 Delivering rich, dynamic sound in a streamlined package, the PM-200 is the ultimate monitoring solution for Roland's V-Drums. Packing 180 watts of power, the PM-200 features a custom full-range speaker system and rugged cabinet specially optimized for reproducing the famously expressive V-Drums sound and response. And with integrated mixing and direct output capabilities, it's easy to interface with other devices at home or on stage. Pro-Level Sound for Playing V-Drums The PM-200 is the perfect complement to any V-Drums set. The custom 12-inch speaker and horn tweeter project big, full-range sound, and 180 watts of power provides ample headroom for both home playing and stage use. The front face is angled for optimal sound monitoring while seated at the V-Drums, and a full-width bar handle on top offers a convenient way to carry the monitor and adjust its floor position. Versatile Onboard Mixing With its integrated mixer, the PM-200 allows you to monitor backing music and external devices along with your kit. There's a dedicated V-Drums input, plus 1/4-inch and 1/8-inch line inputs for connecting electronic percussion pads, smartphones, and music players. Independent volume controls are provided for the V-Drums and line input sections, and a two-band equalizer is on hand for shaping the overall sound. Direct Outputs for Recording and Stage Performing The PM-200 is also equipped with two XLR direct outputs to send sounds to a mixer or recording device, providing additional flexibility for using the monitor in stage, rehearsal, and studio applications. And while the PM-200 is a mono monitor, its inputs support stereo connections, enabling you to pass true stereo sound to the direct outputs. When a V-Drums module is connected in stereo to the V-Drums input, a convenient rear panel switch allows you to output its sound in dual mono or stereo to suit the needs of your setup.